This project was created by the students of the ENG 477 Toni Morrison seminar offered this spring in conjunction with Professor Tisha Brooks and Professor Howard Rambsy in the English Department. 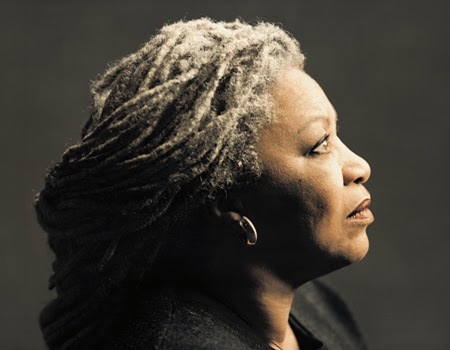 Many people know that Toni Morrison is a world-renowned author of fiction. She has written ten novels, including The Bluest Eye, her first book; Beloved, her best-known work; and her most recent novel, Home. Morrison is also the first African American woman to win the Nobel Prize in Literature, an honor she received in 1993. However, Morrison is more than a writer of fiction. Over the past three decades, she has also produced a considerable number of essays, memoirs, reviews, eulogies, lectures and speeches in addition to publishing a well-respected book of literary criticism, titled Playing in the Dark: Whiteness and the Literary Imagination, and editing The Black Book: Three Hundred Years of African American Life. Over the course of this recording you will hear excerpts from this rich and varied collection of Morrison’s non-fictional work. In addition to hearing passages, chosen and read by students in the ENG 477 course, you will also hear their reflections on Morrison’s writing and the discoveries they have made through encountering her work. It is our hope that Morrison’s words will inspire you as they have inspired us—that you come to understand her central commitment to using language and art, rooted in black culture, to examine, critique, and resist the evil of injustice and oppression, while showing us how to survive and thrive in the midst of it. Time: Thursday 9:45 a.m. - 12:15 p.m.